Use the power of subliminal messages to program your subconscious to relieve or even completely eliminate pain. Do you suffer from headaches, backaches, PMS, chronic pains...? Do you get in so much pain that you can't think about anything else? Do you think that pain killers are harming your health? Do you want a natural solution that will reduce the aching and allow you to finally experience pain-free life? It's hard to live with pain, especially if it's a chronic state. Medications are effective remedies for pain control, but there's a huge downside to them - they can harm the body, and if taken over a long time may lead to dependence and addiction. Like so many others, you have probably been overlooking the most natural solution to your physical pain - to utilize the mind-body connection, and to heal your body with the power of your mind! Our mind - the unconscious part of it - controls all of our bodily functions, and it also controls the level of pain we're consciously feeling. Have you ever wondered why some people can endure a lot more pain than others? It's simply because their minds work in a different way. You can train your mind to adopt that same way of functioning when it comes to pain! However, this "training" has to be performed at the subconscious level - if the conscious part of your mind was able to handle it, then it would be enough to just say to yourself: "I don't feel any pain". But as that's not the case, we have developed this unique subliminal album to target the parts of your subconscious which are directly responsible for pain control. Program your subconscious to be less sensitive to pain. Right now it's focused on pain and even tends to aggravate it; these messages will gradually "tech" it to control pain and even to ignore it. Influence the flow of energy and nutrients in your body, and aid cell regeneration in required areas. As your mind is completely in control of all of the functions of your body, it will send increased blood circulation, and resources to the site of pain in order to soothe your pain and speed up your healing. Allow you to experience pain free existence. The longer you use this album the stronger the new connections between your neural cells will be, and your mind and body will eventually be able to completely eliminate pain from your life. You can use these messages anytime you need to, or even leave them on for prolonged periods of time while you work, study or even exercise. Ease your pain today and get back on with your day with help from this revolutionary subliminal audio album! 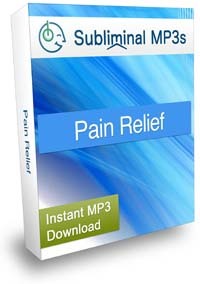 If you specifically suffer from back pains then try our chronic back pain relief album also.